Hurricane opened recently, I went to see it with the Sage of Kettering. The film tells the story of the Polish 303 Squadron in the Battle of Britain. The film starts with Polish pilots working their way to England in the chaos of falling France. One pilot, with some Swiss ancestry, pretends to be a Swiss Swiss watch salesman, another steals a biplane from a French airforce aerodrome, a fine Czech pilot is also in the Squadron. They end up at RAF Northolt, sharing the base with a plotting station and hence a large number of WAAF personnel, with predictable consequences. The Poles appear to be a ramshackle lot, lacking the discipline and bearing that the RAF expects. A Canadian officer is given the apparently thankless task of knocking them into what the RAF would recognise as ‘shape’, the pilots (many very experienced and some aces) are frustrated as they are kept back from action whilst they learn English and how to manage their fine steeds. There is some humour as a truculent Warrant Officer is brilliantly mis-translated by one of the pilots as he barks to his colleagues. It should be said that whilst the Hurricane, Sir Sydney Camm’s wonderful, chubby little puncher is the nominal star of the film, with it featuring in all the fighting and airfield scenes, it hardly gets any mentions, except a passing comment that a pilot thinks it is wonderful. They start off with training flights and escorting Blenheim bombers (There is still one flying in the UK, for what those guys went through, here is a 1989 documentary). Some of the Polish pilots are sent off to bombers, despite their experience. From what I have read, at the time, RAF training didn’t include simulating combat or even gun firing for some pilots. The Poles harmonise their guns at around 150 yards, because they like to get close before firing. After a bit of indisciplined flying (breaking mission orders by going to attack German aircraft), the squadron is declared operational and success starts to come, one pilot has the foresight to make a rudimentary chapel in an old hut. News of their success spreads, Air Chief Marshal Dowding and Sir Keith Park discuss the squadron and are pleased with it (there are no politicians in this film). They are not introduced, and the actor playing Dowding looks a bit more like Park than he does Dowding imho, but you eventually find out who they are). The Poles have a constant awareness of the horrors being visited on their homeland, going to the Polish government-in-exile offices for invariably bad news of relatives executed, which the film shows in grim ‘flashback’, one shot by firing squad, another NKVD-style, another hanged. The contrast with the attitude of the British, who seem to regard the war almost as an unpleasantness is brought out with a trip to the Dorchester where Society ladies treat the pilots to a reception in their honour, which turns out to be an awkward occasion. A press visit to the Squadron ends with one reporter getting punched for ghoulishness. The generally good publicity leads Dowding to hope out loud that it might induce friendly volunteer pilots from overseas to turn up and help. Relations with the Poles and British crews aren’t good at the start, but they improve. May I digress? There is a little bit of a sub-plot with a passing incident of ‘domestic violence’ towards a WAAF, which may explain why there was an advert in the trailers for Women’s Aid, which to me gave the misleading impression that only men commit domestic violence, the man in the trailer hits the woman, but he vapes rather than smokes, you can’t show really bad things you know. In the film, everyone seems to smoke, well, not when refuelling. The film suffers a bit in the depiction of aerial combat, the CGI has an old video game feel to it at times, and we appear to be seeing the same scenes over and over again. As the film goes on, they start to take casualties, some get horribly burned, some crack up and can’t get themselves to kill Germans. The film does not pretty-fy the war, it does get across the burning hatred that the pilots had for those who had destroyed their homeland. At one point, a British officer says that they will be back in Warsaw soon, and the Sage and I muttered ‘1989’ and ‘1990’. The film skips forward to the end of the War once the Battle of Britain concludes, the characters not apparently any older 5 years on, and the Poles are excluded from Victory Parade, and they are fully aware of what Stalin is doing to Poland, and they are told that they are to be booted out and sent home, one of the Attlee government’s choicer crimes, but it turned out that many were allowed to stay or emigrate to a third country. Some of the pilots are seen in Civvy Street, one a newspaper vendor (apparently people used to buy newspapers). It cites an opinion poll stating that 56% of the British population wanted the Poles to be sent back to Stalin’s new Poland. The film is a great tribute to those fine men and their ground crews and it’s well worth seeing if you get the chance. It’s better than Dunkirk, with its wet Bank Holiday at the seaside feel, if not as tense as Darkest Hour. And we saw the film in Corby, after a fine carvery in Rockingham. 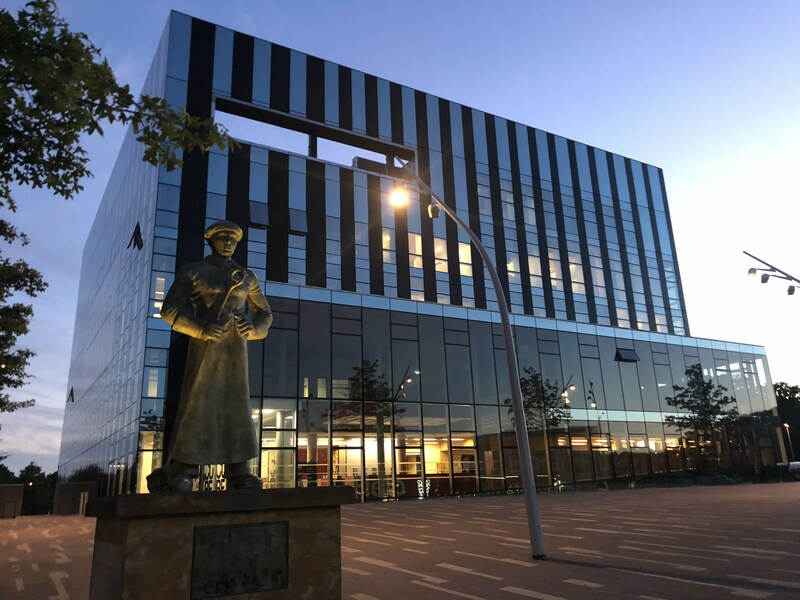 Corby is perhaps a strong contender for the most soulless town in Britain, a riot of 1960s and newer architecture, complete with its own ‘mass hero’, the Steelworker. We go there, so you don’t have to. It does however, name a square for James Ashworth VC. It cites an opinion poll stating that 56% of the British population wanted the Poles to be sent back to Stalin’s new Poland. I suspect that opinion poll of being a contrived left-and/or-government effort to justify Attlee’s wishes – at minimum, one of Sir Humphrey Appleby’s “ask the right questions to get the answer you want” efforts, and quite possibly communist influenced. I heard plenty from the generation before me about the many WWII poles in Britain (some of whose children or grandchildren I knew) and the general attitude was they were great, made an effort to fit in (e.g. a Polish family in our street always provided hot-dogs for all at the local bonfire night), etc. I simply don’t believe a poll saying a majority wanted them sent back to Stalin’s tender mercies, though I can easily imagine how Sir Humphrey could contrive such a poll, if whatever minister Attlee appointed indicated that that was the answer desired. Thanks for the review, will definitely catch it when it comes out online. Britain owes these brave foreign pilots a great debt. My own great uncle was a Spitfire pilot, and sadly killed in action over Malta at the tender age of 23. This is a good infographic showing some of the numbers of different foreign pilots involved, albeit only for the Battle of Britain. Assuming it’s being cited accurately, of course, if it ever happened. Referencing it in the movie is probably a veiled swipe at Brexit, or what the film-makers conceive Brexit to be about. There was a similar movie a few years ago about Czech pilots, Dark Blue World, which was pretty good, though likewise suffering a little in the air scenes. EdMJ (September 17, 2018 at 2:35 pm), thanks for the infographic’s information. I note with amusement that its title is pretty ridiculous even for the Independent. “How Britain owes its Immigrants a Debt of Gratitude” is its silly (and PC) title. The flyers from New Zealand, Canada, Australia, Rhodesia, Jamaica and Palestine were all subjects of the crown and members of the Empire in 1940 (the 9 Southern Irish flyers raise technicalities). The Belgian and French flyers were not Immigrants but refugees from Hitler who expected to return and probably in the main did so. The 7 US flyers likewise may well have gone back to the USA after the war. In 1940, the Polish and Czech flyers doubtless hoped to do the same – alas, their countries exchanged Hitler for Stalin. These people came to Britain to fight Hitler. Leave it to the PC to turn them into ‘immigrants’. I was at school with a boy whose father was a Polish army officer who fought the Germmans, E&Ed to Sweden, made it to UK and joined the Free Polish forces, and then fought in Italy. He was demobbed from the Free Polish forces in the late 40s. He hated Nazis, but he hated communists more. He got to stay in the UK, not sure how, and he worked as a lower-level administrator in the education system the rest of his life. For a while, he worked at the same school we attended. Both his children (a son and a daughter) have been extraordinarily-successful, one as a chartered accountant, the other is a professor of microbiology. He and his wife were respected members of the community – she taught Polish at evening classes – and I know there was at least one other Polish family similarly situated in the neighbourhood. I find it very-hard-indeed to believe that a majority of their neighbours, scarcely a decade earlier, would have approved of deporting them back to Communist Poland- and this in a time when racist and xenophobic attitudes were common and freely-expressed everywhere. The betrayal at the end of the war was the final kick in the teeth – and the film does not sugar coat it. The character (the characters were real people) we see most in the film refuses to humiliate himself by begging the Atlee regime to be included in the “resettlement scheme” and says he will go overseas and make his own living. He did – he became a mercenary in Africa before finally being killed in France (most likely the KGB finally got him) in, if I remember correctly, 1986 – only a few years before the Soviet Occupation of Poland collapsed. As for Corby – Stalin style statues and all. 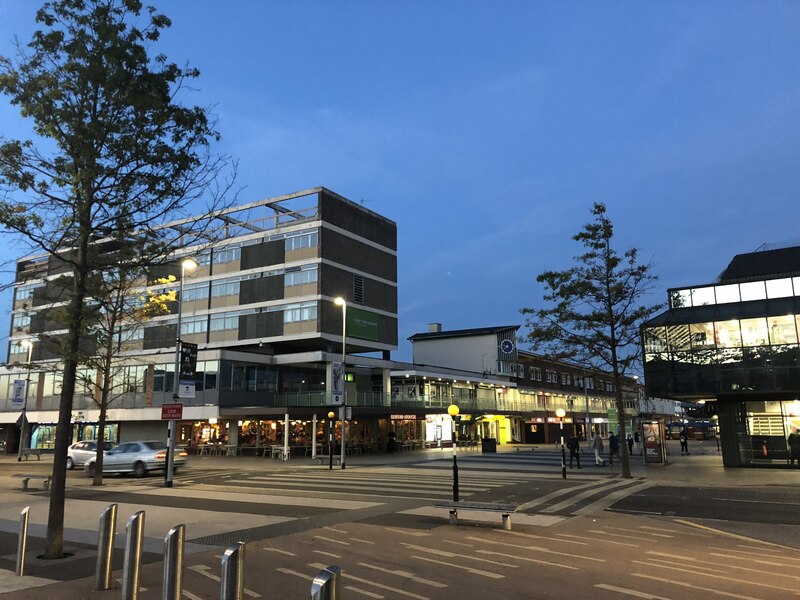 Well at least the cinema is in the middle of the town – convenient. Rockingham really is a gem, a close to thousand year old castle above a village of centuries old ironstone buildings – with views that are (as yet) unspoiled down into the heart of the East Midlands (Rutland and Leicestershire). No doubt there are plans (made the normal alliance of leftist politicians and Big Business) to ruin everything. I can only hope that some-how the Watson(or Wentworth-Watson) family (kin of the Wentworths and Fitzwilliams – the patrons of Edmund Burke centuries ago) can hold out. Britain is dying around us – and no defence of Britain is allowed (no conservative television stations are allowed in Britain, not one, and Mrs May and her European Union masters will soon get rid of dissent on the internet as “Hate Speech”). I hear that Poland is different, that there is still real resistance to the left there, I hope that is true. Although, like Hungary and all other nations, Poland will soon face a choice – the bribes of the European Union government (and its friends the Corporations – pushing pro E.U. propaganda today, as they do every day on the BBC and Sky) or, alternatively, to make the choice for freedom. The cosy relationship between Big Business and government makes sense for business in the SHORT TERM (keep the politically powerful sweet) – but it throws liberty down the toilet. So one has to make a choice – the money (the bribes) or liberty? One can not have both. That utter swine Donald Tusk has already made his choice – he has betrayed Poland and been well paid by the European Union to do so (and will continue to be paid by Big Business after he “retires” – just as that degenerate Gideon Osborne is). The men of 303 Squadron would have made short work of these paid traitors. llamas, September 18, 2018 at 11:43 am, your experience and memories obviously parallel mine. My impression is that the Attlee government, despite its prejudices, caved quickly about sending back any Poles who had been part of the ‘British’ armed forces in WWII. It was one thing to send back people who had fought for the nazis at a time when we still wanted Stalin to attack the Japanese in Manchuria. It was quite another to try to send back, after the war had ended, people who had fought for us. It is also worth remembering that many Polish soldiers who ended up fighting for Britain in WWII had first-hand experience of communism through being taken prisoner by the soviets in 1939 when they invaded Poland in alliance with the nazis. A very few escaped (Shallow Graves in Siberia is the account of one who managed to get to Persia and thence to Britain). Many others – of those, that is, who managed to survive Stalin’s camps and execution orders till mid-1941 – were eventually able to exit as part of the Polish army that Stalin allowed to go to the middle-east in the brief period when terror of the Germans caused him to keep some of his promises to the British. Obviously, none of the chief characters in the film were in this category, but they would all have known many who were. @Niall — I’m sure there were many Free Poles whose grudges against the Soviets dated back to childhood memories or family stories of the days of the Polish-Soviet war. Niall – the ending of the film is in 1946, the war (as you know) ended in 1945. The Labour Party contained many people who still wanted to appease the Soviet Union – for example the Chairman of the Labour Party Harold Laski (the friend and ally of so many American “liberals”) who denied being a Marxist – but always de facto backed them. The “Fellow Traveller” problem – that Ernest Bevin and so on had to fight in the Labour Party (today the totalitarians totally control the Labour Party – so Ernie Bevin must be spinning in his grave). There is also the war itself. In 1939 Germany invaded Poland so Britain and France declared war on Germany – but the Soviet Union also invaded Poland in 1939, why did Britain and France not declare war on the Soviet Union? Why the double standard? The Soviet Union also invaded Estonia, Latvia, Lithuania and later Finland – and still no declaration of war from Britain and France (still the double standard). Both National Socialist Germany and the Marxist Soviet Union murdered millions of civilians – and the Soviet Union did it first (from 1917 onwards), in the 1930s alone the Soviet Marxists murdered millions of people (as the works of Robert Conquest make clear). This was known to anyone who wanted to know – for example my father (Harry Marks) knew all about it, and he was just an ordinary man in the East End of London. The claim that such people as President Franklin Roosevelt “did not know” is a LIE – as the old Russian section of the State Department prepared detailed reports on what was happening. The “New Dealers” (may they burn in Hell for all eternity) responded by closing down the old Russian section of the State Department and trying to destroy the files (staff members thankfully kept some) as part of their policy of recognising the Soviet regime as legitimate – and that was naught to do with World War II as the New Dealers did this in 1933 and World War II started in 1939. The New York Times was the same lying rag in the 1930s that it is now – ditto the rest of the “liberal” establishment. They cover up what Marxist regimes do because THAT IS WHAT THEY THEMSELVES WOULD LIKE TO DO if they had the power to do it (an unarmed population and armed forces that would obey any order from the “Social Justice” crowd). The influence of the Soviet Union in the Western establishment (and not just in the Labour Party in Britain) was very great. Franklin Roosevelt (the number one hero figure of American “liberals”) not only supported Stalin (treating the murder of millions of civilians by the Marxists in the Soviet Union as a matter of no importance at all – not compared to building a new society), he also presented (as TRUTH) the lying Nazi figures about how the Jews controlled the professions in Germany in 1933 – this was the excuse that Franklin Roosevelt gave for rejecting Winston Churchill’s plea to attack the death railways and the extermination camps of the Holocaust (see Paul Johnson’s “A History of the Jews”). To the two faced Franklin Roosevelt (the man who was so polite to Jews – when he wanted their votes) it was fine to gas millions of Jews to death – because the Jews had controlled the professions in Germany in 1933 (and they HAD NOT controlled the professions in Germany in 1933 – the National Socialist figures that Roosevelt cited were LIES). To someone like Franklin Roosevelt, Nazi Germany was a rival to the power he wished to create – that is why Nazi Germany had to be destroyed, he did not really object to their tyranny (and had nothing but contempt for the “reactionary” beliefs of ordinary Americans – the beliefs in the Bible and the Constitution he pretended to share, to get the votes of ordinary people). That is the man the American “liberals” revere above all others – and not because they do not know what he was, but because they DO KNOW what he was. As for the best known members of the “liberal” establishment in Britain – E.H. Carr (the “historian”) presented the lying statistics of BOTH National Socialist Germany and the Marxist Soviet Union as the truth. And that hero of the Economist magazine (to this day) J.M. Keynes wrote, in the introduction to the German edition of his “General Theory….” in 1936 about how the new German government had done away with old limits on start power and how it was controlling such things as prices and wages and society generally – and how this was a jolly good thing. I hope I do not have to remind people who the German government was in 1936. You are of course right in your contempt of FDR, who along with Woodrow Wilson (both Democrats of course) thought he knew so much more than the mere Founding Fathers that he trashed the US Constitution. 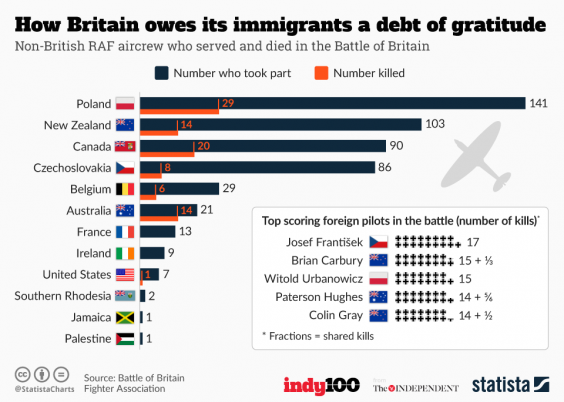 However, if 56% of British people really did believe that Polish fliers should return home in 1945, it is easy to understand why. From 1941 they had been fed a steady diet of propaganda from the BBC (of course) as well as films and newsreels about our brave Soviet allies. I don’t think there was much mention of the NKVD and the Gulag. The official line was that our brave Soviet allies had liberated Poland, so why would Polish patriots not want to go home? The British people had, after all, voted for a Socialist state in 1945, so why should exiled Poles not want to enjoy the same benefits of Socialism at home? Thanks John K, you saved me asking a question along exactly those lines.